Have you ever thought of the ways that you could be marketing your agency better? Whether you’re leading a full-service agency, a mid-tier digital media firm or a brand new agency start-up, you need to market your agency better. Being in a highly competitive industry filled with gurus, influencers and freelance specialists, the client has more options today than any other time in the history of marketing and advertising. On top of this, we won’t go into the 127 tasks in your meeting’s calendar, 43+ unread emails in your inbox from this morning and that creeping caffeine addiction that has been going on for a few months now. Being busy is an understatement, but if you think that you could market your agency better than you would love some of these advanced tips and strategies to stand out from the competition. We are all marketers here, right? A quick disclaimer that we will stay away from the generic marketing strategies (like Google Ads, SEO, SMM, content marketing, guest posts, etc) and focus more on improving the overall marketing outreach efforts for your agency using some advanced or underutilised tactics. You might already have some templates to follow up with potential clients, sending proposals or pitching business ideas. Creating an email template library will not only help you be more efficient with your outreach efforts but also provide more time for client managers and increase the overall productivity of the teams. – Proposals and services template. – Ask for testimonials, feedbacks or surveys. Choose different styles from the Vision6 template library. You can also automate emails for specific jobs. Partnerships take time to build but if done right can be an absolute ‘Goldmine’. You may have come across a business opportunity where you think you could have referred it to someone else. It could be because of low budgets, out of scope projects or too good to be true type offers. Depending on the services your agency offers, you could easily create partnerships with other agencies that are non-competitive to you but are in the same industry. There’s so much business being referred currently just by word of mouth but not enough people to refer to. So, stand out, invest in building great relationships and market you agency better. Guess where is the best place to find fellow agencies and professionals under the same roof. You are right! (Events). Event marketing is an amazingly underutilised strategy to market your agency. The perception of event marketing is that there’s no direct way to analyse what, where and how it impacts your branding. But, with the current technology and improved ticketing systems and analytics, it’s sure on its way to becoming a lucrative form of prospecting and establishing top/ middle of the funnel activities in the future. Networking at events is not the most fun for some people. But, if you are leading or being part of the event, it becomes much more comfortable when people come to you to have a chat. So, the next time you are at one make sure you introduce yourself, exchange business cards, engage in a little small talk and demonstrate some of your interests and expertise. Vision6 presents the largest annual email marketing summit in Australia, called EMSA (Email Marketing Summit Australia) and features both local and international speakers. It’s always been a sold out event which creates a lot of buzz around the brand, builds new business partnerships and makes it stand out. Get your agency to attend EMSA this year. Vision6 sponsors some of the marketing events across Australia, both monetary sponsorship and in-kind (as an event email partner). If you don’t want to spend money on sponsorship, then provide a service from your agency to help add value to the event. You could even promote the event officially or unofficially to build relationships with the event managers and organisers to get a foot in the door. LinkedIn makes it super easy and less awkward to stay connected with people that you meet at marketing events. It also helps you show off your knowledge on specific topics, agency-specific content and indirectly build that credibility. Use LinkedIn’s InMail feature to send personalised messages to prospect with both agencies and professionals. If it’s too awkward for you to reach out cold, then you can always use your existing network to introduce you to a relevant source in the industry. Prospecting every day for 5-15 mins will grow your network immensely and help you find credible talents and business opportunities to market your agency better in the long run. Ever heard of the ‘Von Restorff Effect‘? Studies have shown that the cognitive bias called the ‘Von Restorff Effect’ makes the item more memorable when it stands out from its peers. In essence, it means to be creative, be memorable and stand out from the crowd. Show off the projects that you are most proud of and make sure it’s memorable. Let your client be the Batman of your winning story. Be the Alfred, who supports them as a trusted advisor. Promote your client’s winnings by using case studies, and they will most likely refer more business to you, love you back and help market your agency better. Podcasting is not the latest trend but has been around for a while now. However, it’s still a very underutilised medium for outreach and branding, especially for small agencies. 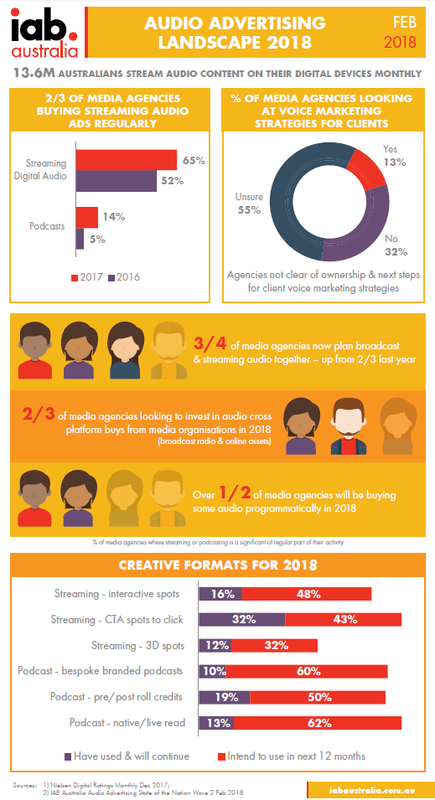 The good news is that podcasting is in an upward trend and that’s why your agency needs to get on it if not already. You know something is kicking off when the trend goes up in triple figures. Majority of the people listen to podcasts on their daily commute or while doing something else unlike watching a video (which needs your eyes to consume media). – Authoritative presence – share industry news, insightful stories, tips and hacks, etc. – Audience Connection – regular content consumption builds relationships. – Simplicity – budget set-up and easy distribution. Sure it takes time, energy and content to podcast regularly but it surely pays off in the long run. Even better, video record the podcast and use it on YouTube and Facebook to market your agency better. Leading to Instagrams’s massive growth after its acquisition by Facebook, it has released some fantastic new features to take on it rivals like Snapchat and now YouTube. IGTV allows agencies to share longer-form video content on Instagram (previously just limited to 1 min long videos). This is the perfect opportunity to stand out from the crowd and establish your brand as there’s less noise on it currently. You could even re-use some of the old content from YouTube and use it on IGTV and see what the response is. Make sure it’s either inspiring, educational or entertaining and not boring or too technical. You know the rest! It will take another 6 months to mature as a platform itself so go ahead and test it out, build your agency brand on it and market your agency better. Voice tech is the latest kid on the block backed by Amazon’s Alexa and Google Home who are building a strong presence in Australia and around the world. Sooner or later we all will be talking to our gadgets instead of typing or reading to get information. Google released a statistic that one in five queries made by search are through voice. The adoption rate of voice tech is on the rise which is why this is the excellent opportunity to understand the dynamics for agency business growth using voice marketing. So, start experimenting with Google Actions or develop an Alexa skill to market your agency better. We all know that a lot of blood, sweat and tears go into building an agency and more so in running it. Majority of these tactics are long-term strategies but needs to be implemented now. The email template library, those non-competitive partnerships, prospecting efforts on LinkedIn, utilising events and using latest tech trends can definitely help market your agency better. Since agencies are amazing at achieving deadlines, I urge you to use the advanced tactics and set deadlines for these long-term goals and consequently see the growth that your agency deserves. Our resident Content Specialist (with three first names) loves storytelling & advertising. He's been in the digital marketing industry for 5+ years. Between stretches of content production and marketing strategies, you might find him consuming mugs of instant coffee, producing music and not skipping ads on YouTube.